They look badass. But they are badishly good for you on a fundamental level, and you, you don’t even want to try to resist. They can and they will be the centre of attention yet they will pretend not to like it. They will make a mess in your kitchen and there will be blood stains everywhere. A pinch of paprika, as spicy as you like it. READY TO MAKE A BLOODY MESS? In a food processor or blender, process all of your ingredients into a gorgeous purplish red, cruelty-free mess. If the consistency is too thick add a little water. If it’s too runny add a little flour or more oats to absorb the liquids. It’s really a no-brainer, you simply blend everything together and shape the dough into burgers, using your hands, which is the best part, if you ask me, besides eating them hot straight from the pan or oven. Add different spices each time to satisfy your cravings. Beets have an earthy umami kind of flavour so, generally speaking they go really well with lemony accents, garlic, hot spices and fresh herbs like dill or parsley. But rules are made to be broken, use what you have and come up with your own combinations. Bake them in a preheated oven until crispy on the outside. 20 minutes should be enough. Or heat a little olive oil in a non-stick skillet and sauté them if you are feeling extra naughty. As always think seasonal and local. Take a fresh, soft bun. Add dollops of hummus or vegan yogurt. Tomatoes, onions, lettuce. These bad boys will make your heart beet. Check out the FOOD section of the Chelfdom. We are the kind of vegans who won't shove their opinions into other people’s faces. 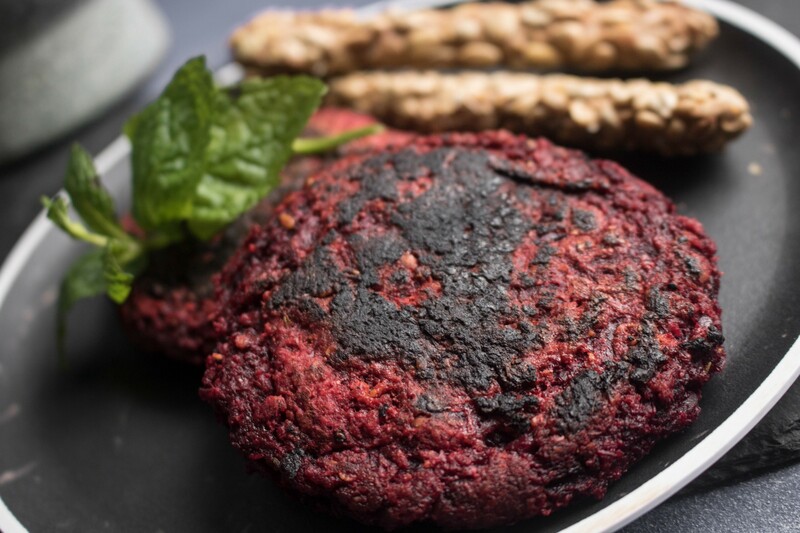 We just provide delicious plant-based recipes. Originally published at www.chelf.net on February 1, 2019.